Universal Avionics received FAA Supplemental Type Certificate (STC) for its new touchscreen EFIS Control Display Unit (ECDU) employed by the company’s InSight Display System. The Touch ECDU is designed to provide fast, easy access for InSight user control and input. 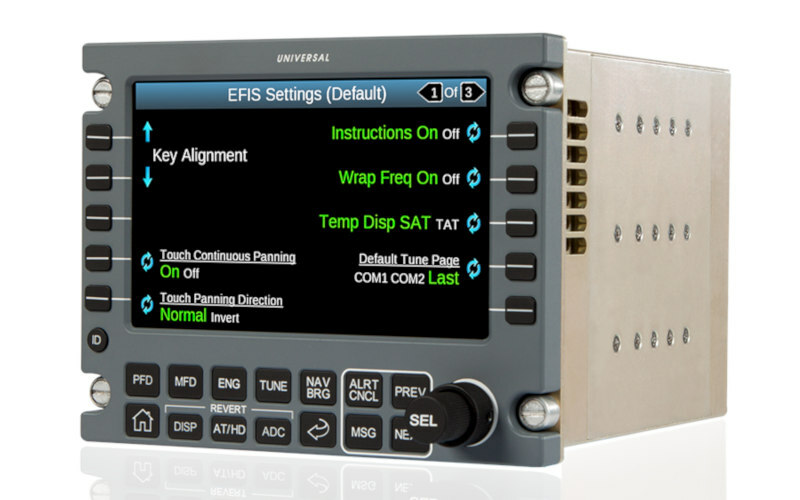 This STC improves operator choice as the ECDU is now available in touchscreen or non-touchscreen versions, which can be leveraged by fixed- and rotary-wing operations. Both ECDU models combine multiple InSight System controls, including the flight displays, FMS, radios, traffic, and terrain into a centralized control device. The ECDU, explains the company, eliminates the need for external panels that take up cockpit space by integrating with the PFD/MFD and standalone radios. The Touch ECDU combines the functionality of the traditional ECDU with an even more intuitive interface for an enhanced, easy user experience. Operators can now use the Touch ECDU, Cursor Control Panel (CCP), or both for unique and intuitive point-and-click system control. Universal Avionics recently announced the availability of two MDL Data Packages to the company’s Authorized Dealer and Integrator Network to support installation of the InSight Display System STC for the Cessna Citation VII 650 model. Both STC packages have been updated to support the Touch ECDU.